Minneapolis, MN is home to lots of bugs! While many of these bugs don’t seem to cause much trouble, some can be downright annoying! One type of bug that continues to bring literal pain to Minnesota residents is the dreaded wasp. If you’ve seen evidence of wasps in or around your home it’s time to call the your favorite Minneapolis MN exterminator — Eco Tech today. For many a wasp sting is nothing more than a big annoyance. You are stung and then you deal with the pain and itching for a few days and then you go back about your normal everyday life. For others, a wasp sting is much more serious. Some individuals are allergic to wasp or bee stings and if they are stung they can go into what is called anaphylactic shock. This type of shock can bring about serious complications including hives, trouble breathing, nausea, and diarrhea, vomiting and in some rare cases even death. If you or someone you love is allergic to wasps or bees and you see them around your home it’s best to call a wasp elimination or bee removal company at once. At Eco Tech we take each wasp problem very seriously. We use a proven strategy to remove wasps or bees from your property through a serious of steps, which we’ll go into below. Inspection – First we inspect your property to determine the type of wasps that you have and where their nests are located. We then provide a plan to the customer as to how we will go about getting rid of the wasp problem. Finding the best possible method of wasp removal – At Eco Tech we work to use the most humane and organic methods of wasp removal. These may include a variety of different methods to ensure that all wasps have been removed from your property. Exclusion Assistance – Not only do we get rid of the wasps in and around your home, but we also work with you to prevent future colonies of wasps from infiltrating your home. 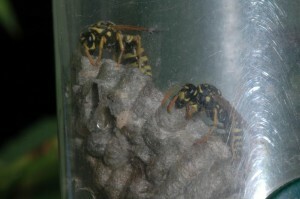 Having Trouble With Wasps in Your Minnesota Home? If you’re having trouble with wasps in your home, call Eco Tech today at 763-785-1414 and we’ll be happy to send one of our pest control experts out to your home to assess your needs.